Being that I’m such a cutting edge guy, I pride myself on being able to sense new trends just when they’re on the verge of blowing up. For instance, not only was I popping my shirt collars back in 2001, I was also wearing flannel pajamas way before Nirvana or Pearl Jam ever hit MTV. Anyway, I thought I would bring to your attention the latest up and coming trend in movie marketing: cartoony illustrations and hand-lettering on movie posters for indie comedies. The first time I remember seeing this style was when the Criterion Collection DVD for Rushmore came out. The cover featured artwork that was drawn by Wes Anderson’s brother, Eric Chase Anderson, and at the time I thought it was really cool and unique. It perfectly captured the child-like whimsy of Jason Schwartzmann’s character Max. Eric has since illustrated covers for The Royal Tenenbaums and The Life Aquatic as well. That’s when the copycats started to emerge. The poster for American Splendor, used a mix of real photography with a comic book style background (which was definitely appropriate, for obvious reasons). Napoleon Dynamite, a movie accused by some of ripping off Wes Anderson’s style, also incorporated many hand-drawn elements for its poster, including pictures of Napoleon’s favourite animal, The Liger. The poster for Noah Baumbach’s The Squid and the Whale featured a photo of the actual actors with a hand-drawn dining room set behind them and a title that looked like it was scrawled by hand. The connection is more subtle, but seeing as Baumbach is a friend and collaborator of Wes Anderson’s, it was no coincidence. Now over the past year, we’ve seen an explosion of posters and DVD covers continuing to appropriate the style. I became very acutely aware of it while at a promotional screening for Juno, where they were giving out t-shirts with cute slogans on the back in that all-too-familiar hand-scribbled outline font. When I saw the same style logo used in the trailer for the upcoming Judd Apatow comedy Forgetting Sarah Marshall, well, that was it for me. The trend has officially gone mainstream! Below are some examples of the style of artwork I’m talking about. I have to admit that I do generally dig it, but it seems like it’s becoming a crutch for marketing folks who are trying to find a certain audience for their quirky dramedies. Do you like it? Are you getting sick of it? Feel free to post links to any others that I may have missed in the comments below. I guess if it’s apt then that’s okay. The otherside might be that the marketing is trying to “trick” people into thinking that some quirky comedy is actually an action movie or something I mean we’ve all seen the trailers for movies and then while watching them realized that this was not the kind of movie they were advertising. I definitely like it. I mean it can be used for good or for bad, but I think it’s a cool idea. I think of the posters above, the Sideways one is my favourite. The Napoleon Dynamite and Juno ones do nothing for me. I mean is it just me or is that shadow-drawing in the bottom right corner of the Juno poster making everybody else hate the movie as well? 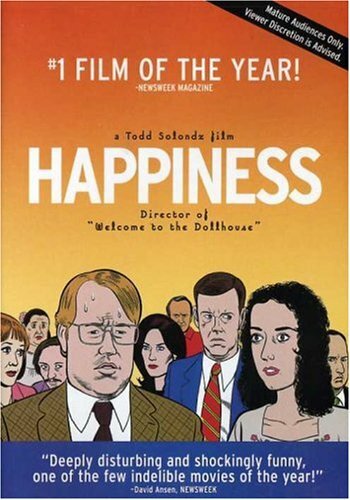 Just checked IMDb, I think Solondz might have done it first. Good call… totally forgot about Happiness. I’m sure there must be others out there that were even earlier. I still think it’s Wes Anderson’s influence that’s rubbing off on most of these though. It’s like he has single-handedly created an entire sub-genre of film. Except movies like this have been made for a hundred years in Europe. True… there was that article I posted a link to a while back listing all his various influences, and it was pretty much dead on. But he’s definitely had a big impact on American cinema over the past 10 years or so. Yeah I won’t disagree there. Even though for me, he has been overtaken by Alexander Payne, Wes Anderson did give american cinema a kick in the brain.